"Thanks for registering for the race. Bib numbers, shirts, and timing chips will be issued Thursday morning. There is one aid station. It will have a microwave. There will not be a coffee maker. We are aiming to have sandwiches at lunch, something warm like pasta and/or pizza for dinner, and oatmeal for breakfast. There will be other things like cookies, candies, pretzels, and nuts. Perhaps water, too . . ."
We quickly learned about Steven's understated sense of humor. 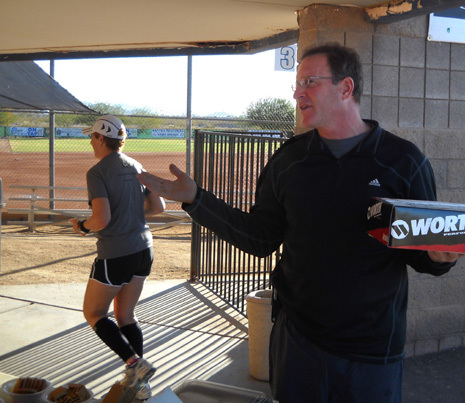 Several runners, including Jim, were a bit mystified about the water comment, for example. Steven was accommodating, however. When Jim asked if an energy drink like Heed would be provided at the aid station (so he'd know if he needed to use our own supply), Steven promptly notified the runners he'd have both Heed and Gatorade at the aid station. 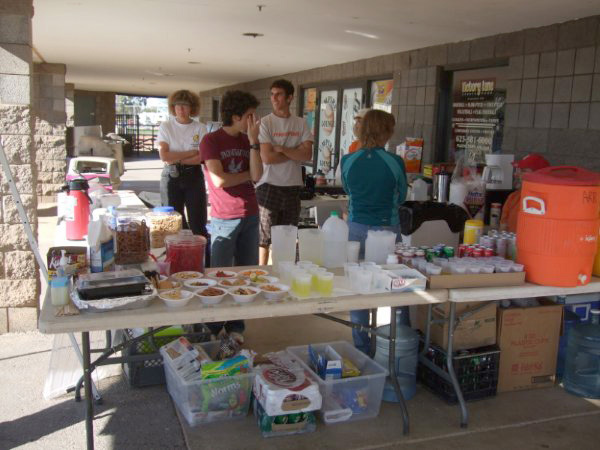 Photo by Nick Coury of the well-stocked aid station with plenty of volunteers throughout the race. He was kidding, of course. Turns out, the aid station had plenty of beverages and hot and cold foods to satisfy most of the runners (except those with strict diets, who should know to take the foods they want to races and not whine when there aren't enough choices that meet their particular criteria). There was more than enough water, energy drinks, soft drinks, hot chocolate, even tea. One of the volunteers brought a coffee pot and real coffee, too. In addition to the standard salty and sweet aid station munchies, there were also grills to make cheese quesadillas for lunch and pancakes for breakfast. Pizza Hut delivered three kinds of hot pasta, including lasagna and mac & cheese, for supper and pizzas for a late-night snack. The aid station fare was just one way in which this race exceeded our expectations. By now you should be used to	me ending our annual web journal with an entry dated January 1st of the next year. That's because this is the third year in a row we've been involved with a race beginning in one year and ending the next. 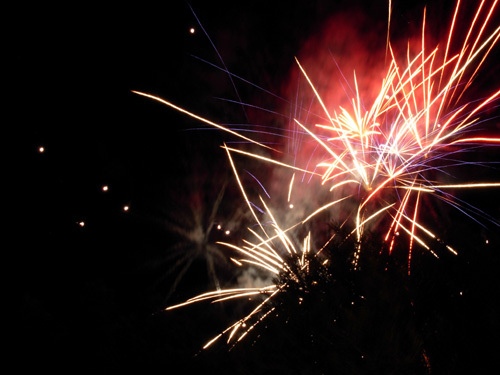 We think there's no better way to celebrate New Year's Eve than a running event! Even a short race like a 5K could be scheduled like this, you know. It's not just crazy ultra runners who do it. In late December of 2007 and 2008 we had so much fun at the Across the Years (ATY) 72-, 48-, and 24-hour runs at Tana and Rodger Wrublik's Nardini Manor in Goodyear, AZ that we were very disappointed last April when Rodger notified the race committee that because of business conflicts, the race would be on hiatus this year. It was several weeks before Rodger, the race host, and Paul Bonnett, the RD, made a public announcement about the status of the race. 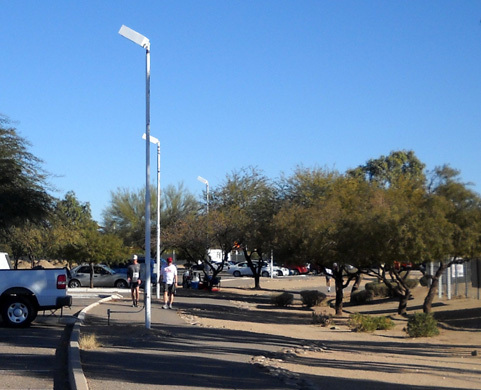 In the meantime we corresponded with some of the key volunteers in the Phoenix area who had been instrumental to the success of ATY, volunteering to help anyone else who was willing to take on the responsibility of directing the race for one year. One of the main problems was the need to find another venue, as Nardini Manor is not only one of the Wrublik's businesses, it's also one of their residences (they also own the Wyman Hotel in Silverton, CO and rent or own a house there). We kept our fingers crossed during the spring and summer. 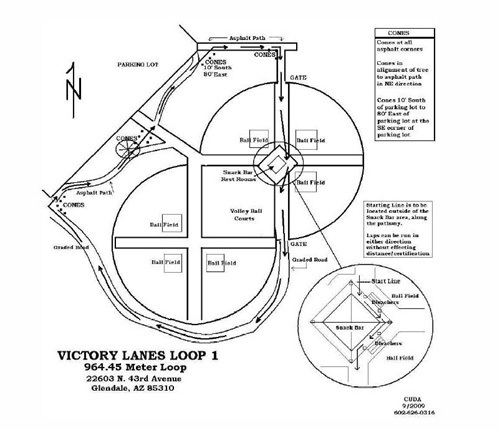 We were happy when the race committee was notified in early August by Steven Finkelstein that the Arizona Road Racers (ARR) were tentatively planning to stage an alternative 24-hour race at Victory Lane Sports Complex in Glendale, a northern Phoenix suburb, on December 31. He wanted feedback from the committee about the race entry fee. Once the fee and other critical pieces were in place, Steven announced the event publicly on the ARR website, ultra list, and running publications. Phil Davis was the initial RD but later changed his mind; Steven generously stepped up to assume the responsibility. 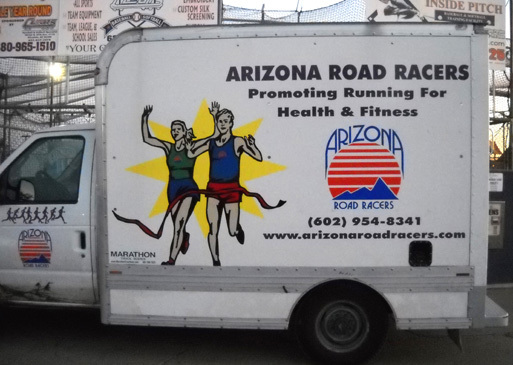 I don't know if it's ironic or fitting that the Arizona Road Runners came through with an alternative to ATY this year -- but I'm glad they did. Across the Years has had a long (25 years in 2009) and somewhat tenuous history, which you can find on the ATY website. Harold Sieglaff began the race and directed it by himself for several years. Later he enlisted more assistance, finally asking Paul Bonnett for help. 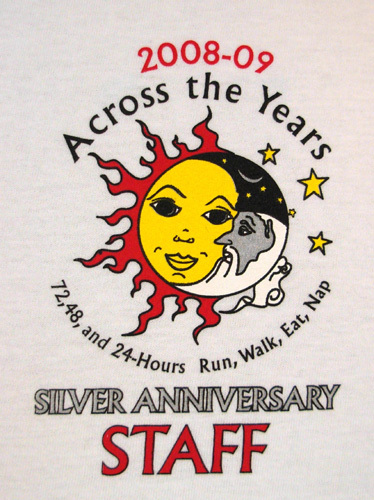 Since Paul was ARR president about then, it became an ARR event for several years. In the early 2000s, when the race was facing extinction once more, Rodger offered to build a track for the event at Nardini Manor so it would have a more permanent "home." 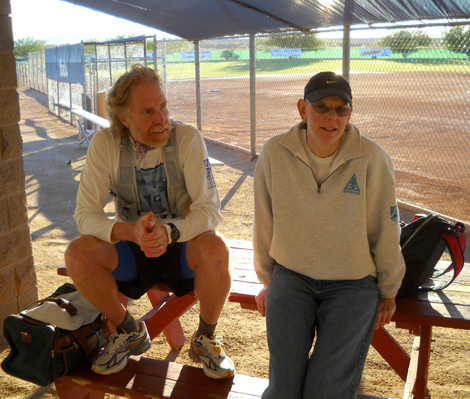 He not only saved the race but he, Paul, and the dedicated race committee they formed helped transform ATY into one of the country's premiere running events. After my first time there, I declared it to be my new favorite race. So you can understand my disappointment when Rodger announced he simply couldn't do it this year. Paul was unable to assume full responsibility, including finding a new venue, and still maintain the high standards everyone has come to expect of ATY. The event was put on hiatus with no promises it will be continued next year. 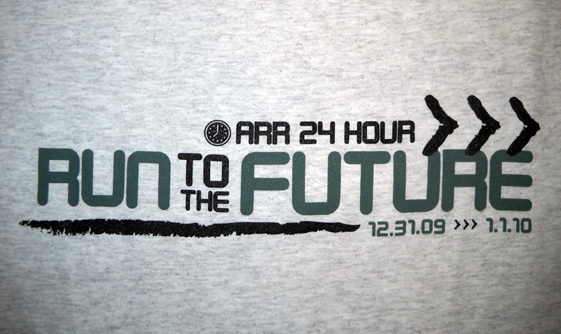 The alternative race has an entirely different name: the ARR 24-Hour Run to the Future (RTTF). Only the date and general geographic location (metro Phoenix) are the same. For simplicity's sake -- and due to lack of time for sufficient planning and staffing -- there is no 48- or 72-hour race this time. The club will consider adding those events in 2010 if ATY isn't held. When we learned about the new race in August, Jim and I promptly wrote to Steven, then Phil Davis, then Steven again (as the RD position changed hands) to offer our thanks, encouragement, and volunteer support. We knew from all the race committee e-mails going back and forth that several key members from ATY would be involved with the alternative race. That was good news. Both Jim and I planned to run this race as soon as it was announced but we didn't enter it immediately. There was no entry limit or deadline; in fact, race-day entries were accepted, quite a far cry from races that fill up many months in advance. The only disadvantage to not signing up early was a fee increase closer to race day; $85 was the highest fee, which is very reasonable for what runners received at this 24-hour race. Then life intervened: my run-ending knee problems and Jim's plantar faciitis. Both threatened to quash our plans to enter Run to the Future but we were still determined to help with the race. 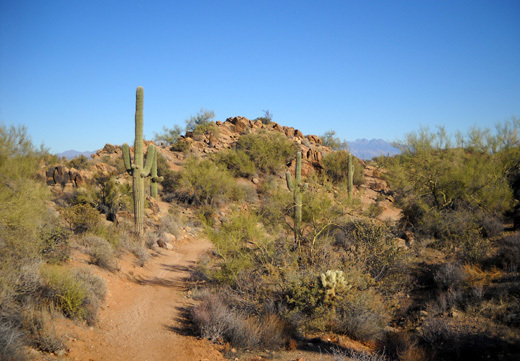 I knew for three months that I shouldn't enter Run to the Future but I almost did after we got to McDowell Mountain Park. I was having a great day on the trails. The endorphins kicked in and the thought occurred to me that it would be very cool to run/walk 30 miles on December 31-January 1 to celebrate my 30th running anniversary -- I began running on January 1, 1980. 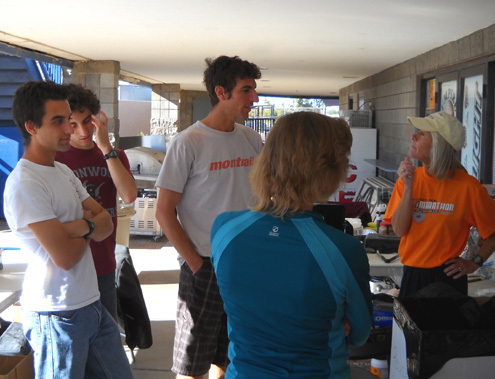 L-R: Nick, Nathan, Jamil, and Pati Coury talk with another volunteer in the aid station on race day. I rationalized my decision real easily. Run to the Future was low-key with only 30+ runners entered in mid-December. I figured I could help with registration before the race, walk 3-4 hours, work the aid station a while, walk another 3-4 hours, work another stint at the aid station, then finish out my 30 miles around the midnight hour as 2009 morphed into 2010. Steven and the volunteer coordinator, Sandra Fontaine, were fine with that. OK then! Two days later I came to my senses and did NOT enter. I realized I'd regret that many miles after so little training since my bike wreck in early August. The longest I've run/walked or hiked is only about three hours in recent weeks. No way would it be smart for me to go for ten hours or more in the race, even just walking. As good as it might be for my psyche, it wouldn't be any good for my cartilage-challenged knees or any of the rest of my under-trained muscular-skeletal system. 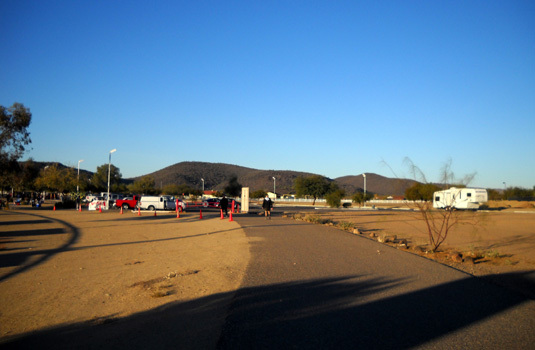 camper and aid station area. Nick Coury took this photo of us near the end of the race. Jim had a similar tough decision to make: seriously under-trained (over-rested??) from his plantar faciitis problem, should he take the risk of worsening the condition and straining other bodily systems that weren't ready to go even the marathon distance, let alone any serious ultra distances?? He rested and treated the PF aggressively for two or three months and it began to improve with time. 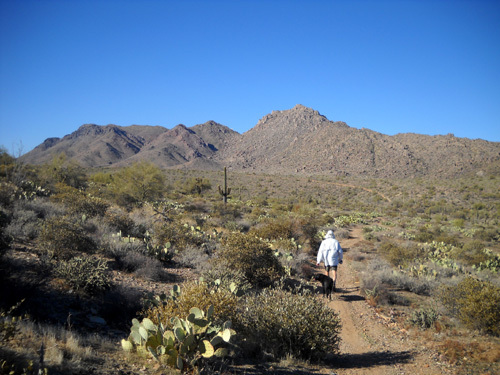 He worked up to several 15�- mile "long runs" on the trails at McDowell Mountain Park in December. His PF improved, then didn't get any worse as he increased his mileage, so he decided about a week before Run to the Future to enter the race. He stated his goal at 100 miles. When he told me that, we had a serious discussion!! I still don't know why he put such an unrealistic number down (denial?) but I could tell he was determined to go as long and far at that race as he could, knowing full well he might regret it later. I stated my concerns about aggravating the PF and/or sustaining new injuries from lack of training. He promised that he'd stop if he could tell he was making things worse. Long story short: he ended up with just shy of 69 miles officially (more if you count the extra distance he walked to and from the bathroom and our camper numerous times!). He's tired and sore afterwards, but I don't think he regrets a minute of it. And his PF doesn't seem any worse for the wear. In fact, it was one of his shins that bothered him more than anything else at the end of the race, probably because he's not used to running so much on pavement (about 60% of the course was paved). DON'T EXPECT THIS TO BE LIKE ATY . . .
We knew Run to the Future would be very different than ATY because few settings can possibly compare with Nardini Manor -- and very few people can host an event like the Wrubliks. The ATY bar was raised very high in recent years. Even if ATY comes back in the future, it will be hard to sustain its high standards without some modifications to keep the Wrubliks sane. There was not a lot of information on the ARR website about the new event, at least in comparison to many ultra websites. We didn't even find a list of entrants until a few days before the race. It's always nice to know who's coming! The dearth of information raised some questions and concerns in our minds. We asked Phil and Steven some questions via e-mail but we didn't want to bother them with all the questions we had. We figured we'd find out more when we got to Phoenix. We were happy to know that our buddies Matt and Anne Watts would be there. Matt set up his gear in "the tunnel" near the aid station and Anne cheered him on. We soon decided the best way to handle our uncertainty about the race was to follow a maxim we've successfully used before: expect the worst (least, etc.) and anything provided above that will be a nice surprise! This line of reasoning works in lots of situations. And it worked well with this race -- our expectations were greatly exceeded by race management and we were happy with its organization. Run to the Future is not and never will be Rodger's version of ATY, but it was a doggone good race in its own right. We sincerely appreciate all the thought and hard work that went into it. 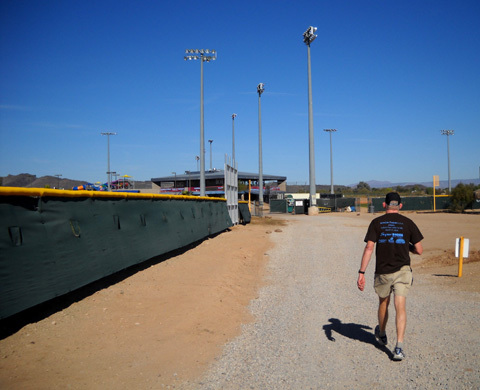 A couple days after we arrived in the Phoenix area we drove 42 miles from McDowell Mountain Park to Glendale to check out the new race venue. 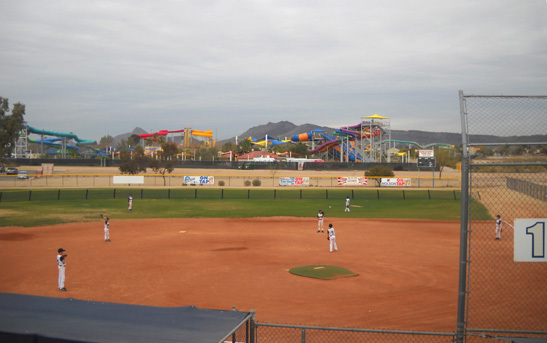 We later learned from the park manager, Mike, that the Arizona Road Racers conduct two shorter runs at this venue. A good working relationship had already been established when members of the club asked about putting on another race there. Mike (shown below) seemed very enthusiastic to have the 24-hour event held on the Victory Lane property, and hung around most of the first day of the race to work and mingle with the runners. Mike, Victory Lane's manager, was present during part of the race the first day. Debbra Jacobs-Robinson runs through "the tunnel" on the left. 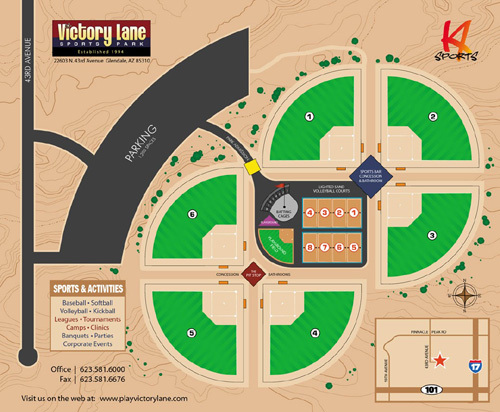 The Victory Lane Sports Complex sounds like a strange place to hold a race but it is actually quite convenient with its large parking area, bathrooms, lighting, and WiFi. All those features were appreciated by the runners, crews, and volunteers on race day. The strong WiFi signal, for example, made it realistic for Steven to post hourly updates with runners' distances to the race website during the event. It also made it easier for volunteers and crews to post photos and progress reports on the internet as the race developed. 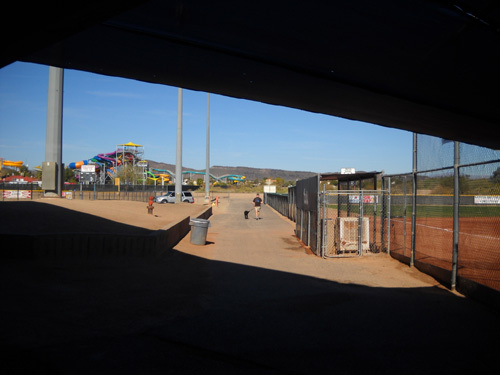 batting cages, a playground, heated restrooms, and a sports bar. 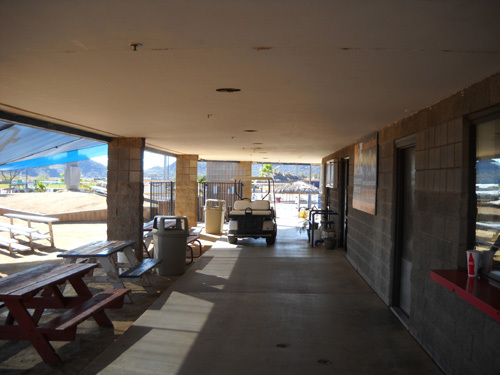 The bathrooms were open on race day, but not the sports bar. We first visited Victory Lane on a Thursday morning two weeks before the race. Grounds crews were busy but no one was using the facilities that day. 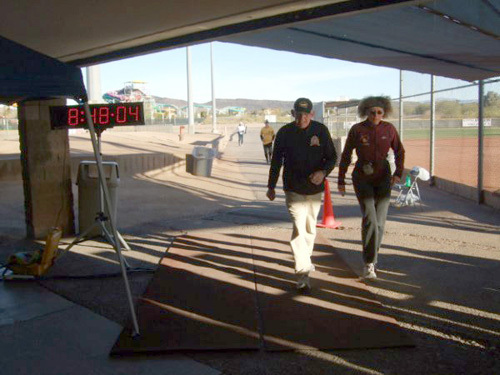 Several weeks before the race Frank Cuda measured an almost-1K loop through the Victory Lane Sports Complex and got it USATF certified so any records would be accepted by governing bodies. 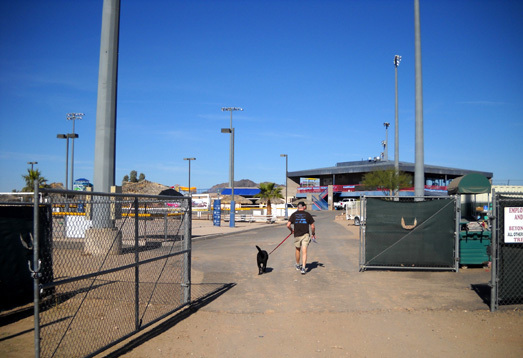 Jim and Cody walk past the timing area (foreground) and ball field #1. We came away with ambivalent feelings about the venue and course. 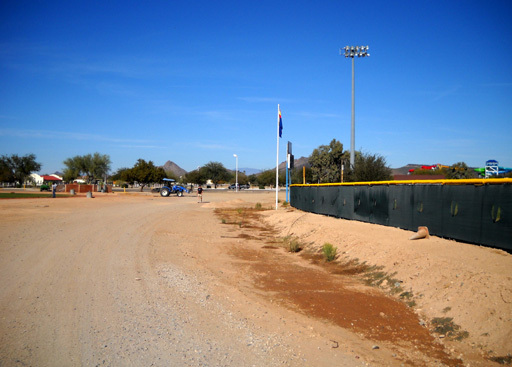 About 60% of the surface is paved, the rest either fine dirt or rough gravel. I'm not fond of either. Jim figured the pavement wouldn't be any more harsh on his joints than ATY's finely crushed rock and dirt surface after two or three days of being packed down by the runners. 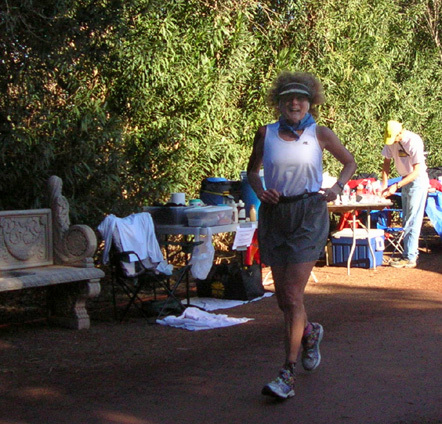 After several hours running on gravel, some of the runners started running on the dirt in several places. 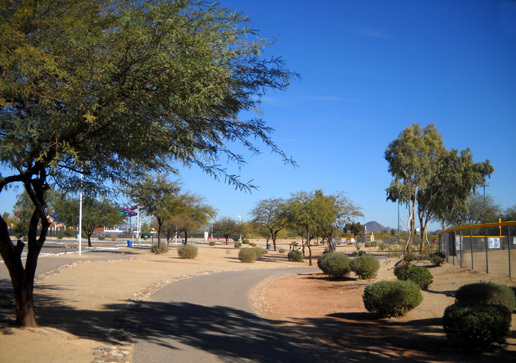 Although the winding paved path through trees near the parking area is nice the course isn't as scenic, shaded, or interesting as the path that winds around Nardini Manor. The back side of the course, behind the ball fields, seemed the least appealing to me but that's where the softer surface is located (bad news / good news). This is not a fast course because of the hard and/or rough surfaces, the multiple twists and turns (lots of tangents to run), and the "tunnel" area between the timing mat and aid station. However, if a runner is very determined to either 1) run a certain distance or 2) have fun socializing with other runners, it's not a bad course. You just have to be focused on something -- pace, people, music -- other than the scenery. And it's definitely more interesting to me than running around a high school or college track. 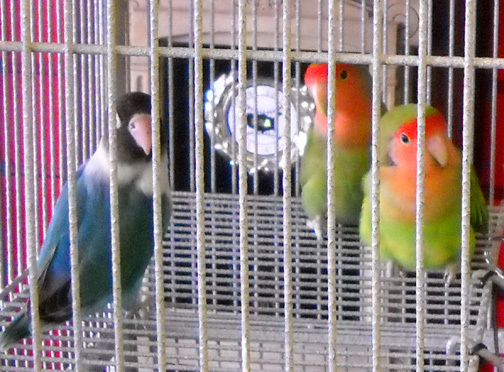 Aid station volunteers have a fun distraction: they can watch the antics of Mike's six love birds in a cage sitting near a window in the sports complex office. They amused me the day before the race when Jim and I talked with Mike inside the building. I was pleased I could see them so well from outside, while working the aid station. Those two green ones are the epitome of cuddling "love birds!" I think Cody needs some love birds, eh? Might be easier than a new puppy . . .
Race course early morning the first day; our camper is to the right. We were very happy that we could park our camper in the lot before, during, and after the race. We asked Phil and Steven about it well before the race, of course, and both assured us there was plenty of room for RVs there. Sometimes RDs underestimate the amount of room needed to maneuver an RV, but this time they were absolutely right. This parking lot can accommodate a LOT of campers but we were the only ones to take advantage of that feature this year. We also made sure that it was OK with Mike-the-Manager. Not only was he OK with it, he refused to accept any money for us to stay there. That was very generous. 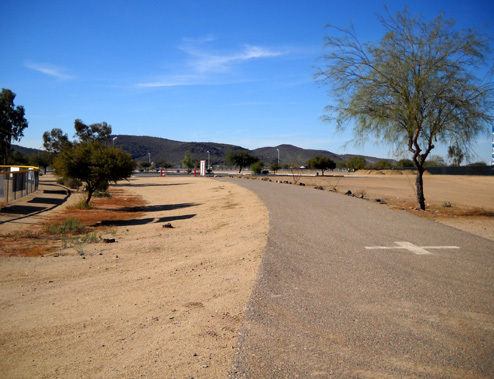 During the race all the runners could park their vehicles next to or very close to the course (see photos above and below). 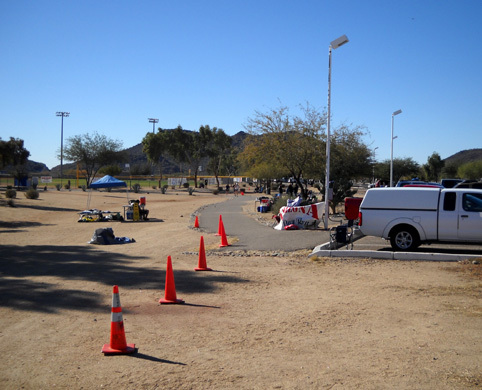 Even with twice the field of 42 entrants than were here this year, runners could still get close enough to the course to put their supplies inside their vehicles and/or set up personal crewing spots on or next to the course. In order to minimize steps, Jim drove our truck closer to the course on race morning so he didn't have to go out to the camper for anything (except a five-hour nap!). Meanwhile, after we got our camper set up on Wednesday afternoon we went inside the gate to talk with Mike-the-Manager and see if Steven and crew were around so we could help get the aid station set up, course marked, whatever. Play ball! 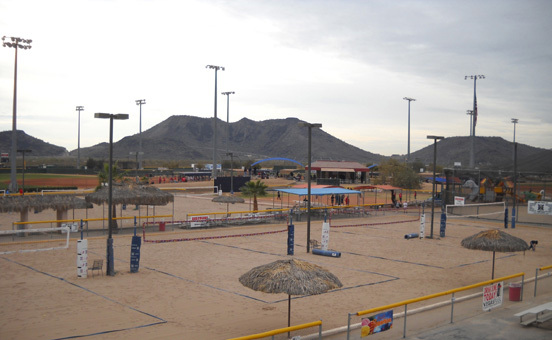 One of four softball fields at Victory Lane. Water World is in the background. While it was still light outside Jim got his clothes, other gear, fluids, and snacks ready for the race. This is about the most laid back I've seen him before a race. Because of his lack of training, he wasn't putting pressure on himself to run any certain distance. Late in the afternoon Anne and Matt Watts, friends from Colorado, drove from the nearby race motel to check out Victory Lane and the course. They saw our camper in the parking lot and came over to visit until it was time for dinner. Unfortunately, none of us thought to coordinate dinner plans prior to the race and I hadn't prepared enough food for four people. There was no pre-race group dinner, nor has there been one at ATY. By 6PM all the folks had left the tournaments and we had the place to ourselves. "Camping" overnight was almost like being at WalMart with all the lights -- but with less traffic. We felt pretty safe even though we were the only ones there overnight. Cody-the-ultra-Lab will let us know if anyone is nearby.